Iranian defense attorney Nasrin Sotoudeh has been detained in Evin Prison under national security charges since June 13, 2018. 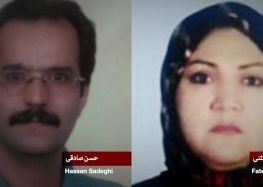 July 18, 2018—Iran received yet another international rebuke for its persecution of lawyers trying to defend citizens’ rights and the rule of law in Iran with the open letter by the International Bar Association’s Human Rights Institute (IBAHRI) to Iran’s supreme leader calling for the immediate release of the prominent human rights lawyer Nasrin Sotoudeh. Sotoudeh, 55, has been detained in Tehran’s Evin Prison since June 13, 2018, and is facing national security charges for representing women in Iran who have removed their headscarves in public in protest against the compulsory hijab law. The Center for Human Rights in Iran (CHRI) strongly supports IBAHRI’s call and urges the international community, from rights organizations to foreign state officials to demand Sotoudeh’s immediate release. “The IBAHRI calls on Your Excellency to ensure the immediate release of Ms. Sotoudeh, and to ensure that she is afforded the full protection of her due process rights in compliance with domestic and international standards,” said the July 10 letter addressing Ayatollah Ali Khamenei that was published on July 17. “The IBAHRI further urges Your Excellency to take all possible measures to ensure that lawyers are allowed to carry out their legitimate professional activities without fear of intimidation, harassment or interference, in accordance with international human rights standards,” added the letter signed by the IBAHRI Co-Chairs Ambassador (ret.) Hans Corell United Nations Legal Counsel and Under-Secretary-General for Legal Affairs, and the Hon Michael Kirby AC CMG, a former Australian High Court Justice. “Imprisoning lawyers for doing their job is an obscene travesty of justice,” said CHRI’s Executive Director Hadi Ghaemi. “The Iranian Judiciary should end its unlawful persecution of human rights lawyers and immediately release Sotoudeh,” he said. Sotoudeh’s husband Reza Khandan told CHRI that Sotoudeh has refused to hire a defense attorney in protest against the Iranian Judiciary’s recent implementation of a list of 20 state-vetted lawyers exclusively allowed to defend detainees held on politically motivated charges in Iran. “The IBAHRI expresses serious concern over the unwarranted interference with the professional duties of lawyers, as it is an unacceptable intrusion on the independence of the legal profession which undermines the rule of law and threatens democratic principles,” said the IBAHRI’s letter to Khamenei. Article 9 of the International Covenant on Civil and Political Rights (ICCPR), to which Iran is a party, protects the right to freedom from arbitrary arrest and detention. Article 14 guarantees fair trial rights, including that the person charged with a crime has the ability to communicate with legal assistance of their own choosing. In 2010, Sotoudeh was sentenced to 11 years in prison for the charges of “acting against national security,” “collusion and propaganda against the regime,” and “membership in the Defenders of Human Rights Center.” An appeals court later reduced her sentence to six years in prison and she was granted early release in September 2013 after serving three years. Well-known human rights lawyer Abdolfattah Soltani is currently serving a 13-year sentence in Evin Prison for peacefully practicing his profession in Iran. Operating independently from the International Bar Association, the IBAHRI is a global legal community promoting and protecting human rights and the independence of the legal profession worldwide.